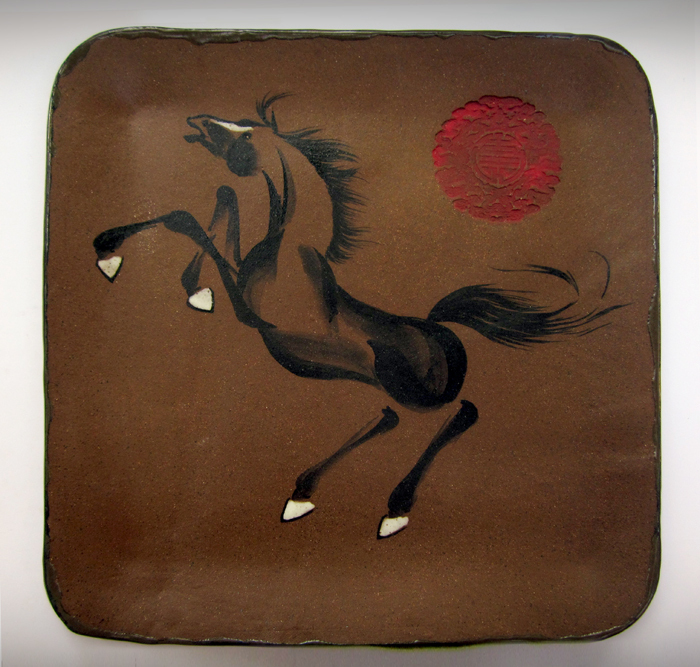 Powerful brushstrokes reflect the tradition of the Far East representing this Year of the Horse with the work of Washington area artist Tracie Griffith Tso in an exhibit at the Clinical Center at the National Institutes of Health, July 14 through September 5, 2014. This dual media exhibit explores Chinese brushpainting on paper and pottery, focusing on the power and strength of the horse, accompanied by a collection of spontaneous flower-bird compositions. Ink paintings on rice paper show the lighter side of the brush with snowy, moonlit backgrounds and soft water scenes. Black ink adds contrast and movement to fish, birds, flowers and horses. An earthy echo is apparent in high-fire brown and white stoneware as dimension adds texture, shine and curves to the equation. Koi wind around a wine chiller, a black stallion dances across a platter and a panda perches on a teapot. Handpainting on wheel-thrown and hand built pottery is framed by symbolic patterning, peppered with auspicious red seals called chops. Griffith Tso began studying Chinese painting at age 12 and specializes in spontaneous brushwork. The award-winning artist developed her style with a teacher who was schooled by a master in Hong Kong. Her introduction to pottery was as a teenager at a local art center, and she returned to the clay medium in 2005, partnering with potter Patricia Ferrell at Brushy Fork Creek Gallery in Crofton, Ky. Scope Gallery. The artist and her husband, along with her muse and rabbit, Cleopatra, reside in North Reston. This exhibition and sale event runs from July 12 to Sept. 5 and is open to the public. Twenty percent of the proceeds of sales will go toward for the Patient Emergency Fund. The Clinical Center at NIH, Building 10, is located at 9000 Rockville Pike Bethesda, MD 20892. Display cases are located on the ground floor.